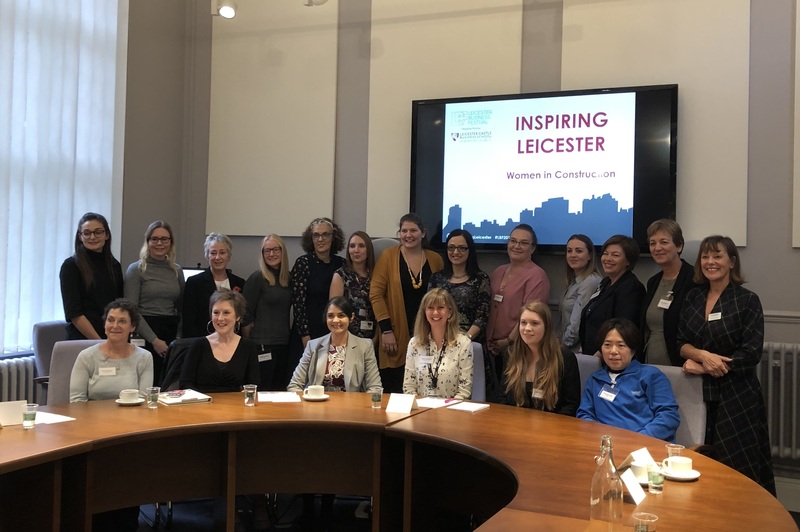 Female leaders in property and construction from across Leicestershire and the wider Midlands region came together last week (7 Nov) for Inspiring Leicester – a Women in Construction roundtable event hosted by De Montfort University at the Leicester Business Festival. The thought-provoking event, which was held at Trinity House, De Montfort University, was presented by Helen Donnellan director of business engagement at De Montfort University and chaired by Liz Cartwright, managing director at Cartwright Communications. The discussion saw women from the construction industry - including company directors and newly graduated students - come together to talk about the gender gap that exists in the sector, and what can be done to improve statistics. Helen said: “It was such a brilliant discussion, where we covered a whole range of topics, from personal experiences as females in the construction industry, to the current alarming statistics on the gender gap and how to inspire more young people – especially girls – into entering the industry. “I was very pleased to hear the views and perceptions from some of the younger participants, including a recent graduate who shared their thoughts on joining the property and construction sector in today’s working climate. “Various attendees added some very interesting insights to the discussion, including how the number of females at architectural universities seem to experience a rapid drop off in later years, to the differing attitudes of mums and dads at careers fairs with their children and overall gender stereotyping. Emily Butson, recent graduate of BPP University; Pam Allardice, proprietor at Allardice Associates; Katie Torkarski, architect at Maber; Jo Morrish, director of HR and training at Pick Everard; Naomi Irvine, director at Naomi Irvine Ltd; Alison Horton, senior engineer at Curtins and STEM ambassador; Nadia Rizk, account director at RizkMcCay; Shruti Trivedi, partner at Roythornes Solicitors; Kylie Chapman, associate (commercial property) at Nelsons Solicitors; Catherine Lambert, associate at Maber; Helen Donnellan, director of business engagement at De Montfort University; Raquel Lesta, events and marketing coordinator at Pick Everard; Louise McCormack, office manager at Timbateq; Jennifer Garratt, marketing coordinator at Pick Everard; Jenny Clarke, associate director at Innes England; Maria Coulter, founder of Construction Coach; Francis Chan, site supervisor at ENGIE FM; Louise Seymour, head of development projects at Leicester City Council; and Liz Cartwright, managing director at Cartwright Communications. The event was live streamed on social media, and can be watched back at @CartwrightComms.